As a baseball player turned blogger, my blogging platform is just as important to me as my bat was to me back in the day. If I went up to the plate with a quality bat that I personally preferred swinging, I would feel more confident, boosting my chances of getting a hit. If I didn’t, I would most likely tap a dribbler back to the pitcher. Similarly, when blogging eventually replaced baseball in life, I discovered using a blogging platform I was comfortable with and liked enabled me to produce better work and results. If I didn’t, I wouldn’t execute as well. But, just like baseball bats, there are countless blogging platforms you can use. Fortunately, if you’re looking for one that’s ideal for your specific situation, we’ve got you covered. Read on to find the best-fit blogging platform for your content creation team and start knocking some blog posts out of the park. Best Blogging Platforms HubSpot Squarespace WordPress Wix Weebly Craft CMS Contently 1. HubSpot G2 Rating: 4.0/5.0 (2,161 Reviews) HubSpot offers one of the most robust blogging platforms around. When drafting your blog posts, you can use their composer to craft content from scratch or with one of their pre-made blog post blueprints. You can also integrate your G Suite Account with HubSpot’s blogging platform to import your Google Docs right into their composer. 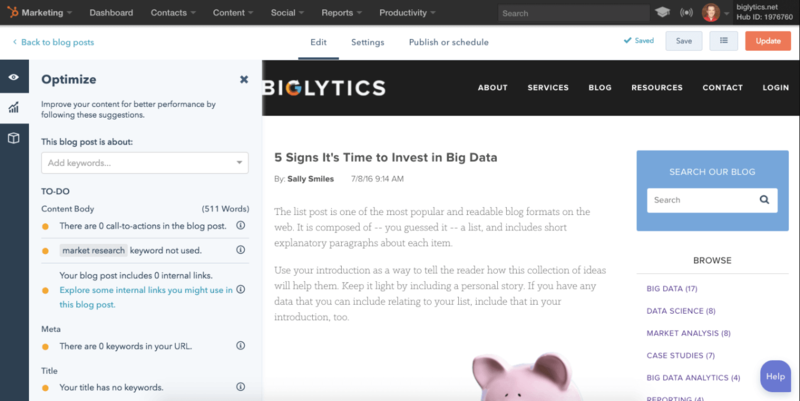 Additionally, you can edit your blog posts directly in their composer by adding comments, offering feedback, and collaborating with other writers or editors on your team. After you finish drafting your blog post, HubSpot’s blogging platform features an SEO recommendations checklist and a topic cluster tool that helps you optimize your blog posts for search engines. You can then schedule your blog posts with HubSpot’s calendar tool, connect to and promote them through your social media accounts and email, and analyze their performance with HubSpot’s analytics tools. 2. Squarespace G2 Rating: 4.4/5.0 (768 Reviews) If you want to build a truly beautiful blog, Squarespace is the blogging platform for you. With their award-winning, fully customizable designer templates and integrations with Getty Images, Unsplash, Google AMP, and more, you can improve your content’s design and boost its ability to grab and hold your audience’s attention. You can also collaborate with multiple writers and editors on your content, integrate and promote your blog with your social media accounts, and manage your blog posts’ comments. Additionally, Squarespace offers some other robust marketing tools that can help you increase your reach and refine your content strategy, like email campaigns, SEO features, analytics, and lead capture features. 3. WordPress G2 Rating: 4.3/5.0 (6,808 Reviews) Powering over 30% of the websites on the internet, WordPress is one of the most popular blogging platforms out there. If you’re creating a new blog, you can register a domain for your site right on the platform. If you already have a website, you can transfer your current domain to your new WordPress site. When creating blog content, WordPress offers hundreds of themes that you can customize with your own branding and content. You can also leverage their SEO tools, social media integrations, and sharing tools to amplify your blog posts’ reach. When it’s time to analyze your blog posts’ performance, WordPress offers metrics and data visualization, like charts and graphs, that’ll help you grasp your readers’ topic preferences and referral source. 4. Wix G2 Rating: 4.2/5.0 (985 Reviews) Wix is one of the most versatile blogging platforms on the market. Whether you own a business or a food review website, Wix has a wide range of templates any blogger can use. After you’ve picked your blog’s template, Wix lets you write and edit posts on desktop and mobile, organize your posts into topics, display Wix’s stock photos and videos or your own media on your blog posts, and create a community of audience members who can make profiles on your blog and interact with each other. To promote your blog posts, you can leverage Wix’s SEO tools to boost your organic reach, push your content to your subscribers with their email tool, and connect and share them through your social media accounts. If you want to measure your content’s performance, Wix also offers an advanced analytics tool. 5. Weebly G2 Rating: 4.2/5.0 (383 Reviews) Trusted by over 30 million people across the globe, Weebly is one of the most popular blogging platforms because it’s incredibly intuitive. With their drag and drop editor, free blog templates, completely customizable design, and a wide range of media options and integrations, you can easily create a blog that’s easy on the eyes. To amplify your blog’s reach, you can leverage Wix’s SEO tools to improve your organic rankings, their RSS feed to update your subscribers with every new blog post you publish, and their social sharing tools to schedule your content on your social media profiles. 6. Craft CMS G2 Rating: 4.2/5.0 (25 Reviews) Craft CMS is a blogging platform that lets you completely customize your blog, manage your content, and analyze its performance. With its personalized content modeling, custom control over your blog’s code, and powerful templating, you can build your very own dream blog. Craft CMS also offers an image editor, collaboration tools, and a localization feature that can translate your content to specific languages. To analyze your content’s performance, you can integrate Craft CMS’ dashboard with Google Analytics. 7. Contently G2 Rating: 4.0/5.0 (17 Reviews) Tailored for enterprise companies, Contently is a robust blogging platform that allows you to run your entire content creation process in one place. To develop your content strategy on Contently, you can organize your blog posts with their tagging tool and flesh out your editorial strategy with their customizable production calendar to. After that, you can effectively collaborate with your team on projects by commenting on and tagging colleagues in your drafts and leveraging Contently's advanced workflow tools. When it’s time to ship your content, you can use their smart content review tools to ensure your content is aligned with your brand, optimized for search, and legally compliant. If you want to gauge your content’s performance and use that data to refine your content strategy, you can compare your content’s performance against industry benchmarks and measure its performance by topic, format, and sources in the platform.